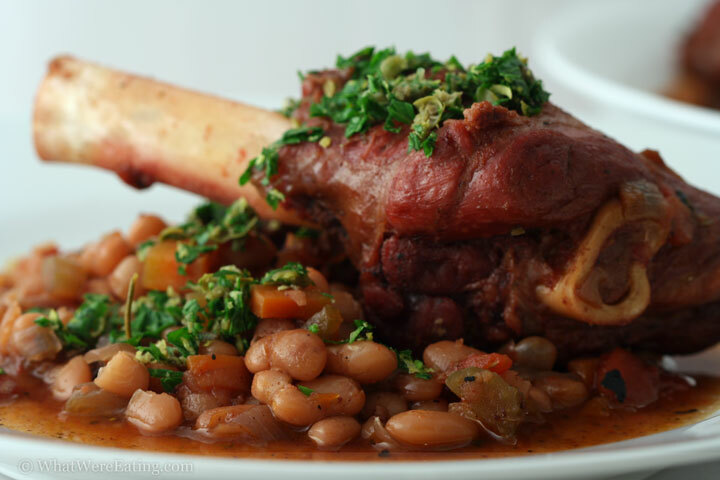 For a special treat we’re eating lamb shanks and great northern beans braised in a mixture of red wine, chicken stock, fire roasted tomatoes, and lots of herbs. The shanks and beans were finished off with our version of a gremolata: finely chopped fresh parsley, lemon zest, and capers. T: if you cooked it for my lunch and could serve it hot in place of my california burrito then that might work out. otherwise, don’t be foolish. I must eat terrible-for-me food for lunch or I’ll go crazy. I assume I would go crazy, i’ve never tried eating a healthy lunch…. and I don’t want to. A: you should try eating slim jims and lays for lunch… heart unhealthy and cold! it’s a twofer. T: and it’s got the salt content of 5 gallons of water from the dead sea. good times. no thanks. 😛 I used to like slim jims, too, until this one road trip a few years ago. Bad. So, back to the delicious lamb. Wow, it was tender and delish. So were the beans. A: hell yeah! i’m kind of a bean-aholic. i’ll admit. but these beans are perhaps my favorite way to eat beans! i do have to admit i’ve never had a real cassoulet before, but my god. 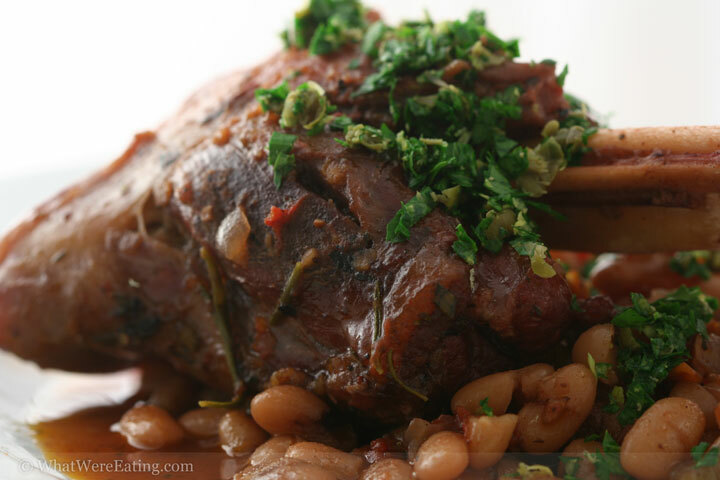 beans braised with both lamb and pork fat (i use a ham hock as well) rule! the rosemary, wine, and fire roasted tomatoes add a nice touch too. this really has to be an all around favorite meal of mine. next to a rack of lamb. T: I gotta ask… what’s a cassoulet? A: it’s a french dish that takes days to make. it’s beans braised with all kinds of yummy pork and meats. mmmmmmmmm mmmmmmmmmmmmmmmmm. T: Careful, you’re going to start a stampede. you know, with all the mmmmm sounds. cows. you know. A: uh… yeah… sure? okay crack head, what do you rate this succulent lamb dish? T: I give it a 4.74/5. It was extremely tasty. It gets a slight deduction for cheating (being lamb). But seriously, it was awesome. I wish we could eat it everyday. What do you give it? A: your rating was spot on with mine. i give it a 4.7/5. it rocked. it rocks. it will rock…when i make it again. while i’m sure i would get sick of it eventually i would love to eat it often. it’s good to keep things as a special treat for that exact reason. i would hate to get sick of it. T: yeah, that’s why people should really consider not getting married. Think about it. A: do i need to call you a crackhead for a second time toinight? Preheat oven to 350 degrees. Add 2 tbsp of canola oil to a dutch oven, or other large oven-safe pot, and heat on the stove over medium-high heat. Once the oil is hot, nearly smoking, add the lamb shanks. Brown the lamb shanks in the oil over med-high heat for about 2 minutes per side until all sides have a nice caramelized brown crust. Remove the lamb shanks and set aside. Once the shanks have cooled, place in the refrigerator until needed. Reduce the heat to medium. Add the diced onion, carrots, celery, and fennel to the pot. Sweat the veggies over medium heat, stirring occasionally, for about 10-15 minutes or until the veggies are soft and the onion is translucent. Add the bay leaves, basil, oregano, thyme, minced rosemary, garlic, and dried great northern beans to the pot. Stir to combine. Allow the herbs and beans to saute in the oil for 3-4 minutes, stirring occasionally. Add the red wine to deglaze the pot, scraping up any browned bits that may still exist on the bottom of the pot from browning the shanks. Add the smoked ham hock, fire-roasted tomatoes and chicken stock to the pot. Season with a pinch of kosher salt and freshly cracked black pepper. Stir. If the beans are nearly tender adjust the seasonings as necessary (making sure not to over-salt the dish, the liquid will continue to reduce). Add the browned lamb shanks and whole sprigs of rosemary to the pot. On the stove, bring the ingredients in the pot back up to a boil. Once at a boil cover and place back into a preheated 350 degree oven. Allow the shanks and beans to braise for another 2 hours at 350 degrees or until fork tender. Remove from oven and taste beans for seasoning levels. Adjust seasoning as necessary with kosher salt and freshly cracked black pepper. Remove the rosemary sprigs before serving. Serve hot and garnish with a healthy dose of our version of gremolata. Enjoy! Add first 4 ingredients into a bowl. Stir to combine thoroughly. Season to taste with freshly cracked black pepper. Goes great on anything, especially lamb shanks and osso buco. Enjoy! If you think it may be weird, or may get searched by TSA too many times, don’t bother with the artichokes. Would you maybe want some lamb bones to take back with you? I’m sure TSA would love that! The Grassfed Revolution has begun! Eat grassfed meat (better even than organic) and you won’t have to abstain for health reasons. Red meat is actually healthy if it’s from a grassfed ruminant. And yeah, lamb shanks are great! Lamb shanks rock and when they’re cooked like this, they rock even more. I wish I had time to cook them more often. It is raining and borderline snowing here in Vancouver, BC Canada. I purchased some amazing lamb shanks from Big Lou’s (http://biglousbutchershop.com/) and immediately thought of your amazing blog. I can’t wait to have my house filled with the aroma of beans and shanks. I will let you know how it turns out, but I have a feeling it will be a winner!